The extent to which ethical behaviour correlates with profitability has been the million dollar question for businesses since time immemorial, with no easy answer. To put it another way: is good ethics good business? In this regard, if the revelations pertaining to Uber and CenturyLink in recent months are anything to go by, alleged bullying and sexual harassment in the case of the former and allegations of unauthorised charges made to customer accounts with the latter, ethically dubious business practices seem to be no barrier to achieving success. By no means isolated cases, the alleged actions of both is worthy only in the respect that it throws the spotlight on corporate governance as a thorny issue, as well as picking apart the notion that behaviour of this type is par for the course in business. Indeed, there is now considerable consensus that behaviour of this ilk has been allowed to go unchecked for too long. But times are changing. According to a ‘National Business Ethics Survey’ (NBES) carried out by the Ethics and Compliance Initiative (ECI), the attitude to ethical behaviour differs markedly between Generations X and Y and Baby Boomers, with the later generations less tolerant of misconduct that is misleading (such as that exhibited by Volkswagen) or fraudulent (as in the case of Wells Fargo). 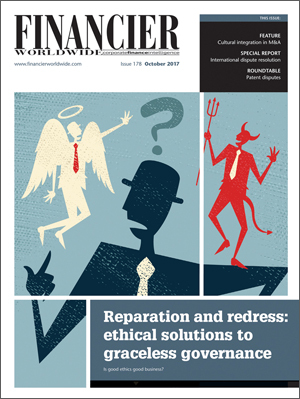 As a consequence, reputation risk is often costlier to companies than the fines or penalties imposed by regulatory bodies. Clearly, as far as the aforementioned companies are concerned, as well as many others across the globe, attention to governance, ethics and compliance was severely lacking. In addition, what these examples make abundantly clear is how important an effective ethics and compliance programme can be in fostering a culture of integrity that can shield a company from becoming ensnared in damaging scenarios. Uber and CenturyLink are hardly alone in the dubious ethics and graceless governance department. How then can we gauge the extent to which companies are failing to give due care and attention to their ethics and compliance responsibilities? For Nick Hawke, head of governance, risk and compliance at Lysis Financial, the enhanced regulatory requirements and increased focus on ethical behaviour introduced following the 2008 financial crisis has resulted in a reversal of much of the reputational damage incurred at that time. “These increased regulations were brought about due to the failings within the financial services sector – failings that were a direct result of unethical behaviour and non-compliance with regulatory requirements,” he recalls. Since then, revised regulatory and ethical requirements have been enforced with significant focus and accountability being placed on senior managers – industry and regulatory intervention that other industries have been imitating to improve their own ethics and compliance behaviour. Moreover, the major revisions that have been made to how executive misconduct and ethical breaches are reported means that many more companies are now that much more alert to the criticality of attending to ethics and compliance issues. That said, Dr Alexander Stein, founder and managing principal at Dolus Advisors, holds the view that “while paying attention to ethical breakdowns is demonstrably better than irresponsibility, neglect or dismissiveness, it is insufficient by itself”. Needless to say, a great many companies publish ethics and compliance guidelines, many of which run along similar lines. However, an element these ground rules often fail to adequately address is company culture and the impact this has on the behaviour of individual employees. To achieve strong and effective ethics programmes that provide both an aspirational and directional tone, many companies utilise what is known as an ‘ethical culture audit’ – a process designed to identify and evaluate gaps in ethics and culture alignment. Overseen by the board, the process is typically a blinded employee survey that asks a number of questions. Are the values of the firm clear and actionable? Is leadership committed to ethics and values and, if so, how is it manifest through the culture of the firm? Can misconduct safely be reported? Is the executive team held accountable for misconduct and impropriety? Are employees empowered and incentivised to make independent and unilateral decisions? “According to several surveys, compliance programmes anchored on behavioural ethics spend almost 40 percent less on regulatory and compliance costs than those with strictly rules-based systems,” attests Mr Loeb. A recent study by the ECI – ‘Ethics and Compliance Training: What Gets Results’ – highlights the importance of the training function in fostering a corporate culture that positions ethics as a valuable tool in aiding business success, as well as the efficacy of different training methods. “The study notes that training is integral to the creation and sustaining of a strong corporate culture,” says Dr Harned. “Employees respond better to facilitated training that is engaging and interactive.” In addition, the study lists a range of benefits that training brings, including changing ethics-related behaviours, preventing future misconduct and an increased awareness of relevant laws, regulations, policies, procedures and standards. To what extent then should a company be expected to behave ethically as it travels the road to success? Furthermore, with regulatory, political and social pressures on miscreants increasing, how is the wider attitude to unethical corporate behaviour likely to develop in future? For many ethics practitioners, the best argument for investing in ethics and compliance programmes is the increasing amount of evidence showing ethical companies generating more business in the long term. A company can introduce as many hard-hitting programmes and policies as it sees fit in the search for an effective ethics and compliance solution, however, if its culture is out of sync with its ethical aspirations, then all the hard controls in the world are not going to prevent myriad types of misbehaviour occurring. Going forward, if the corporate world is ever to negate negative perceptions and rid itself of the stains left by grubby ethics and graceless governance, then the adoption and practice of a sound code of ethics has to be considered an obligation, rather than a choice.